Hummer and Son Honey doesn’t grow on trees. There are several steps that take the final product from the fields to your dinner table. It all begins with the honey boxes. 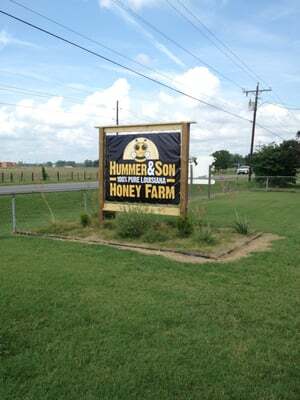 Honey boxes are brought to the Hummer and Son facility in Bossier City, Louisiana, full of natural honey from bee colonies throughout Northwest Louisiana. Two sides of the frame have a wax capping, put there by the bees to seal out moisture so they can live off the honey through the dormant winter months. The frames are put into the Uncapping Machine, which automatically feeds them through, separating the wax and the honey. The wax is then collected and sold to merchants for a variety of purposes, such as candle making, refinishing hardwood and concrete floors, and waxing pool tables. Once separated, the honey heads through a tube to the extractor. There, reused frames, some dating back to 1986, are loaded 60 at a time into the machine, which then spins for 30 minutes. The honey drains from the extractor into the sump. When full, the sump automatically turns on, sending the honey into three holding tanks. Each of these tanks holds 10 drums of honey, which is then roughly filtered and sent to the packing room. A tube running from the holding tanks in the extractor room deposits the honey into holding tanks in the packing room. From these tanks, it’s into a unique contraption called the Honey Drying machine. Here, the honey is heated to a temperature sufficient to remove excess moisture short of pasteurization. After it is refined in the Honey Drying machine, the honey is filtered for dirt, wax, and bee parts. However, the tiny pollen particles are not filtered. Pollen builds up the body’s immune system, making honey a natural defense against allergies. The honey is now ready for consumption and is stored in 55-gallon open-head drums, reconditioned to get the cleanest product possible to the consumer. The drums are stamped with the date, floral source of the honey, the lot number, and the drum number, and they are now in line for bottling. The finished honey is pumped from the drums, slightly heated for ease of movement through the system, and sent into the Fill Master. This machine automatically fills the various Hummer and Son packages, including plastic honey bears and several sizes of Queen Line glass jars. Finally, the honey is labeled, dated, and boxed up, ready to ship out to distribution sites in Louisiana, Texas, Arkansas and Mississippi.